When gothic trousers are not working for your style, check out the selection of chic gothic skirts. Our gothic skirt section holds a number of impressive garments that will pair well with gothic looks ranging from cute and casual to formal and fancy. We offer a number of gothic mini skirts, gothic knee-length skirts, and full-length gothic skirts to ensure you can find the length you want. When you want a period look with a gothic twist, try a gothic bustle skirt or gothic high waist skirt. Gothic handkerchief skirts, long vintage skirts, ruffled layer skirts, gothic mermaid skirts, black fishtail skirts, and gothic high-low skirts give you a wealth of options for your gothic style. Whether you prefer a tattered mesh skirt or a lacy ruched skirt, you will be able to find something to match any occasion. The perfect piece of formal apparel for your elegant ensemble, the Alexandra Black Taffeta Victorian Skirt adds plenty of character to your look. The long black skirt features a design suitable for gothic or period styles. 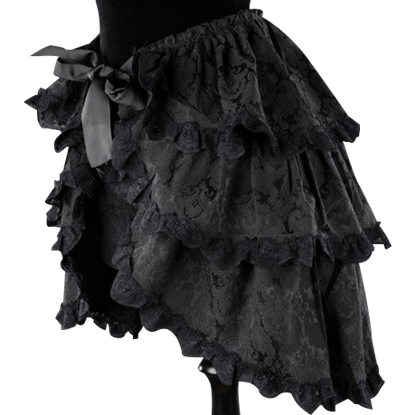 The Alexandra Black Victorian Skirt comes in an elegant style that will suit many different formalwear ensembles. The full-length black skirt is made from satin covered by a black chiffon overlay and trimmed with satin bows. The perfect piece of formal apparel for your elegant ensemble, the Alexandra Burgundy Taffeta Victorian Skirt adds plenty of character to your look. The long wine-colored skirt features a design suitable for gothic or period styles. The perfect piece of formal apparel for your elegant ensemble, the Alexandra Purple Taffeta Victorian Skirt adds plenty of character to your look. The long purple skirt features a stunning design suitable for gothic or period styles. The Alexandra Red Victorian Skirt comes in an elegant style that will suit many different formalwear ensembles. The full-length red skirt is made from red satin covered by a black chiffon overlay and trimmed with black satin bows. An elegant addition to any wardrobe, the Amelia Black Lace Skirt features a dramatic high-low cut ending near the knees in front and falling to the ankles in back. The long waterfall skirt is crafted from layers of black lace. Perfect for creating an incredible steampunk ensemble, the Black and Grey Vex Skirt looks dramatic and playful. The steampunk skirt is a licensed design from Steampunk Couture and renowned steampunk model and fashion designer, Kato. 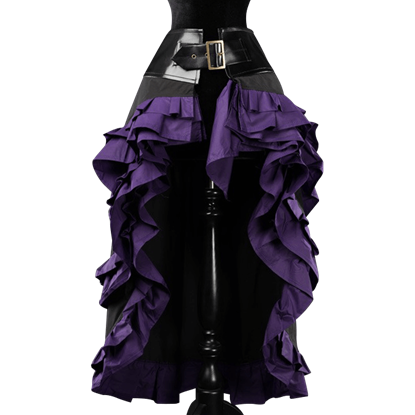 Perfect for creating an incredible steampunk ensemble, the Black and Purple Vex Skirt looks dramatic and playful. The steampunk skirt is a licensed design from Steampunk Couture and renowned steampunk model and fashion designer, Kato. 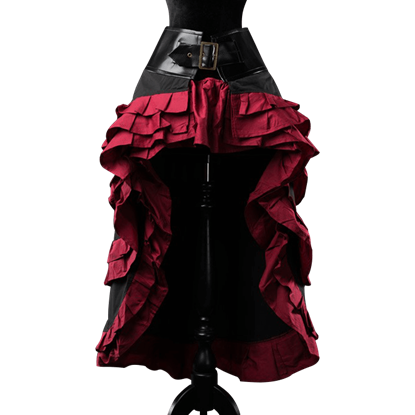 Perfect for creating an incredible steampunk ensemble, the Black and Red Vex Skirt looks dramatic and playful. The steampunk skirt is a licensed design from Steampunk Couture and renowned steampunk model and fashion designer, Kato. Providing a touch of period elegance to your ensemble, the Black Brocade Layered Overskirt fits over another skirt to create addition volume and flair. The brocade material looks stunning with formalwear or Victorian apparel. When a situation demands formality, a skirt might be a good garment to consider. This Black Lace Accented Long Skirt carries a casual look and comfort, as well as a rich design that makes it just formal enough for most occasions. Showing a bit of leg never hurt any look, especially not if you were going for one with just a touch of exotic style. This Black Net Fishtail Dress is perfect for building an outfit that will leave others with their jaws on the floor.